Going paleo has changed me in a lot of ways. But one of the nicest ways is that it’s made me a morning person. Now that I make a good night’s sleep a priority, I wake up easily in the morning, with no alarm, and gently ease into the day. The diet gives me more consistent morning energy levels so I can do awesome things in the morning if I want to, like cooking a fancy breakfast just for the hell of it. This recipe takes a bit of work, but don’t let that deter you. Even with the amount of effort required, I feel like I want to make and eat this every day for the rest of my life. I love eggs benedict. This could be your go-to weekend brunch recipe, or with a bit of planning, you can cook and eat it before work on a Thursday like I did. And I’m not really talking a lot of planning; all you need to do the night before is clarify half a pound of butter and throw together some really easy biscuits. Obviously there’s some room for creativity with the toppings. Back bacon or strip bacon would both be good, but I didn’t have any, which is why I just used pieces of prosciutto. Tomato or cheese slices would be nice too. I made this for 2 of us, and had lots of leftover biscuits and sauce, so I ate those with lunch and dinner. If you want to scale this for 4-6 people, you will only need to scale up the eggs and meat; you will have enough biscuits and sauce to go around. 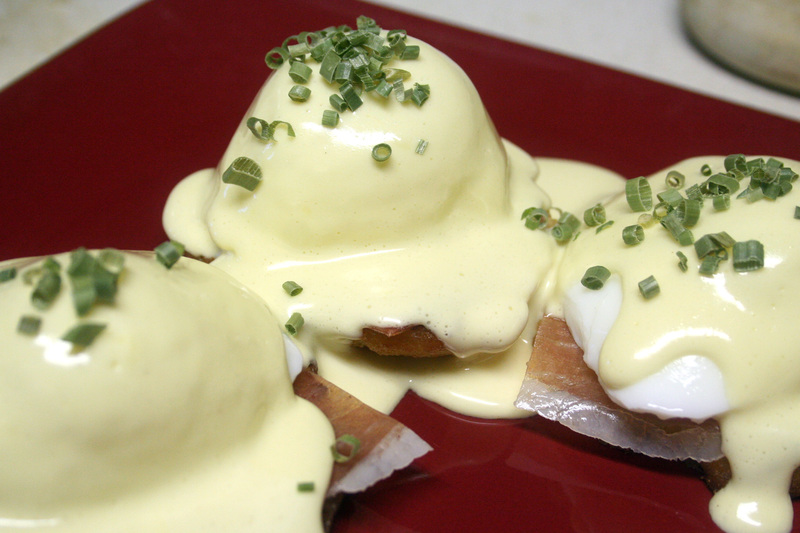 Start by making your hollandaise sauce. I made mine in the blender because it’s a weekday and I don’t have time for endless whisking before work. Heat your clarified butter over the stove to 185F (too hot will curdle the egg yolks, too cool will not cook them). Combine the egg yolks and water in your blender or food processor. 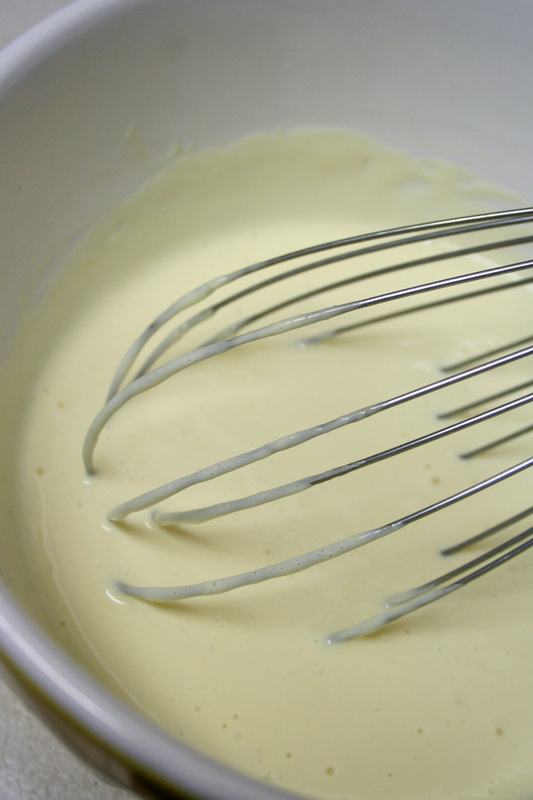 Run the blender and add the butter in a slow, steady stream to emulsify. You should get a nice, creamy sauce. Transfer it to a bowl and mix in 1 tbsp lemon juice. Next, poach your eggs. Fill a large skillet with a couple inches of water and bring to a simmer. Crack your eggs as close to the surface as possible, and simmer for about 5 minutes. While those are going, heat some butter in another skillet. 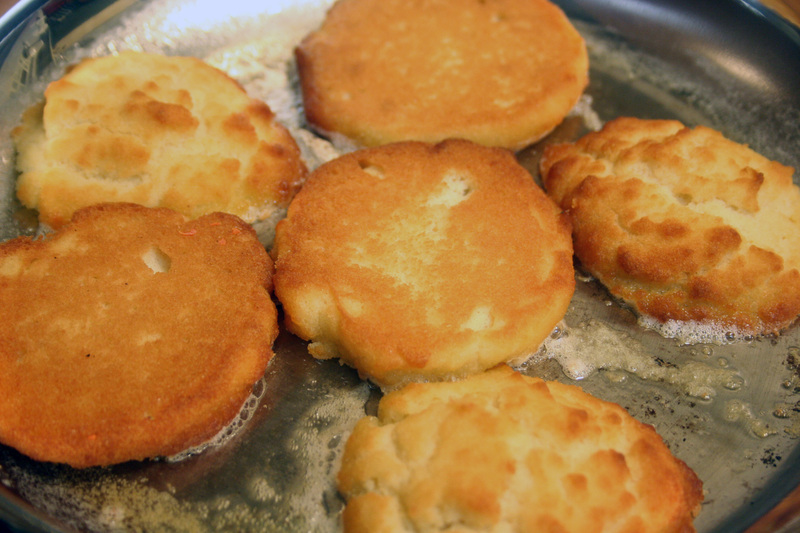 Slice some biscuits in half and place them cut-side-down in the hot butter and toast until golden. Place 3 halves on each of your serving plates, buttered side up. If the top halves of the biscuits won’t sit nicely on the plate and rock around too much, you may want to slice the top off to get them to stay still. Cook your meat topping if necessary (ie for back bacon or bacon) and place on top of the biscuit slices – I just put uncooked prosciutto slices on top so that was one less dirty pan I ended up with. When your eggs are ready, fish them out of the water with a skimmer or spatula and trim off any scraggly bits of egg white with a sharp knife. I transferred them to a separate plate for this step, which had the added benefit of letting the excess water run off of them before I placed them on top of the biscuits. After everything else is assembled and ready to go, spoon generous amounts of hollandaise all over each egg. Seriously, use lots. It’s so unbelievably good, and the biscuits are a bit dry (gluten-free baking, whatcha gonna do) so you’ll want to use them to sop up every stray bit of egg yolk and sauce on the plate.